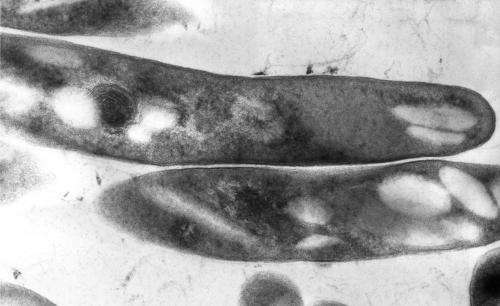 "Living-dead" bacteria exist in limbo: biologically active but not proliferating. Buried in this zombie state, disease-causing bacteria could come back from the dead to re-infect patients. Researchers at EPFL have produced the first evidence of this strange phenomenon in tuberculosis, suggesting new avenues for treatment. Tuberculosis affects over 12 million people globally, and is usually treated with a course of four drugs over several months. However, even after completing the treatment, many patients suffer relapses. Based on studies of harmless environmental bacteria, scientists think that the tuberculosis bacterium, Mycobacterium tuberculosis, retreats into a bizarre "zombie" state in the patient's body, and comes back to life when the conditions permit. Scientists at EPFL have now made the first experimental observation of M. tuberculosis in this zombie state, which seems to be amplified by stressful conditions such as attacks from the host's immune system. The work, which points to entirely new pathways for treating tuberculosis, is published in Cell Host & Microbe. Living bacteria divide and proliferate; if not, they are considered dead. However, some bacteria can go into a strange, in-between state where they are biologically active – producing energy and making proteins – but do not divide. "It's a kind of living-dead, zombie existence," says John McKinney, whose postdoc, Giulia Manina, led the study on M. tuberculosis. "The bacteria are somewhat active, but they're neither growing nor dividing. We refer to this state as 'Non-Growing but Metabolically Active' or 'NGMA'". This state is thought to underlie the relapse of tuberculosis: when the population of M. tuberculosis infecting a patient is faced with an aggressive antibiotic regimen, a part of it falls into this zombie state as a defense mechanism. However, there has been little evidence to support this theory, partly because experimental techniques for studying bacterial populations usually depend on the bacteria actually growing in the first place. There is, however, a way in: the zombie bacteria are still metabolically active, which means that they keep making new proteins. Manina exploited this with a technique that can tag and track a gene that turns on when M. tuberculosis makes new proteins. The technique, developed by the lab's senior scientist, Neeraj Dhar, tags the gene with a fluorescent molecule that can be tracked with a microscope over time. Manina grew the gene-tagged bacteria under different stressful conditions such as limited nutrients, antibiotics, and also conditions that simulate an attack by the patient's immune system. In addition, bacteria were taken from the lungs of infected mice at different stages of infection. Tracked with the fluorescent gene-tag, the bacteria were tested to see how the different conditions affected them over time. The researchers found that M. tuberculosis responds to stressful conditions like immune attacks or lack of nutrients by diversifying its population and pushing some it into the zombie state. "This means that this state could be a defensive response to the patient's immunity," says Manina. "What is unclear at the moment is whether it is an active bacterial response, or just a consequence of an immune attack." In addition, the researchers found that the lungs of mice with tuberculosis contained an unexpectedly large subpopulation of zombie cells. Surprisingly, these cells were not found in mice that were genetically modified to lack an immune system, further suggesting that the immune system and the zombie state are somehow related. The scientists think that this phenomenon could contribute to the bacterium's antibiotic resistance, and that immunity and drug pressure may contribute to the persistence and relapse of tuberculosis. Consequently, these findings could be used to develop novel drug strategies against M. tuberculosis, especially targeting the non-replicating, zombie cells. The group is currently interested in optimizing their gene-tracking techniques and getting a clearer picture of the underlying physiology of the zombie state.